Is it really Sunday again? I hope you have all had a wonderful weekend. Did you do anything nice? Well, since its Sunday, it means it’s the time of the week again when we look at some other fabulous party bloggers work. This week I was feeling dinosaur inspired, so I thought we could take a peek at some dinosaur party ideas. Do you have a little boy that is mad about dinosaurs? If you are considering this as a party theme, then today we have five wonderful ideas for you. Make yourself comfortable and head over to each of these bloggers in turn. You won’t be disappointed!! Amy Atlas always showcases amazing parties, and this dinosaur party is no exception. One of the many things I love about this party are the two tables…one for the little ones and a cheese, wine and dessert table for the adults. Now that is my kind of styling! Take a peek at this party, I’m sure you will love it too! 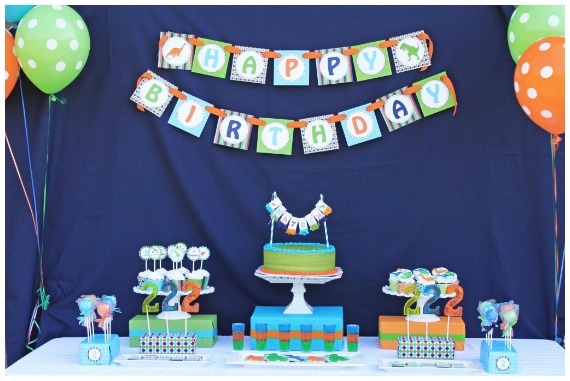 When you are thinking about dinosaur party ideas, this party by Love The Day has it all. It is rugged and rustic, fantastic styling and it is even held in a National History Museum. What more could you want from a dinosaur party!! How about a cute looking dinosaur party? Whimsically Detailed have showcased a gorgeous party which is bright and colourful and certainly super cute! If you are looking for some classic earthy dinosaur party ideas, then this party by Mom It Forward will have you covered. Check out the fossil cookies, they are pretty special!! To finish off the week, I’d like to show you this adorable party by Project Nursery. I love the simplicity of the design, yet it is so incredibly effective. Everything is matching and it gives some great ideas for easy entertaining. You wont be disappointed with this one. So have these dinosaur party ideas given you some food for thought? If you were considering a dinosaur party before, has this confirmed your decision? Which party captured your attention the most? Do you prefer the earthy grungy dinosaur parties or the super cute and adorable ones? Perhaps you sit somewhere in between? With all the answers at your finger tips ‘Planning the perfect party” saves you the stress and headache of trying to remember every facet of planning and hosting that dinosaur party to be remembered, so you have more time to focus on the people and things that matter. I hope you enjoyed this week’s weekly roundup. if you have found some inspiration here, please drop us a comment below and share your thoughts. A great roundup! I love the Stone Age party table for grown ups. I almost always have grown-ups accompanying the kids and like to add some special touches for them.